The church was full last Sunday with 192 (12 over our average). Our Christian school is bigger than ever. The summer of last year I almost thought we were going to have to shut the school down and was content to do so with the problems we had the year before. I thought we would only have a couple of families back then, but we ended up having fourteen students and the school continued. This year our school doubled in attendance with 28 students in every grade from Kindergarten to 11th grade, except for fourth grade. We really need another elementary teacher and our secondary teacher is teaching algebra and physics and I'm teaching trigonometry. Next year we are going to need to teach chemistry. We really need a math and science teacher. I'm also teaching English and doing cross-country training this month. I combine the Bible class with the secondary students and the Bible Institutes students on Mondays. I'm teaching them Life of Christ. Also on Monday, I teach the Institute students: History of Mexico, Great Preachers, and Homiletics. Next semester, I will also be teaching the Institute students Music & Song Leading as well as Philosophy of Missions in preparation for our furlough. With Homiletics, I'm preparing them to preach in my absence; with Song Leading, they can rotate in leading singing; and with Philosophy of Missions, I am preparing them to understand why I will need to be gone for a year reporting to churches and establishing myself again in my home church. We have four men and one woman in the Bible Institute this year. Joel Pichardo, the chief of a 19,000-police division of the Mexico City police force, is taking the Life of Christ class on his lunch hour, as if he is not busy enough. Joel has been knocking doors on my van route on Saturdays with Lazaro, the newly-married young man whom I have mentioned who has really grown in the Lord with his wife, Abigail, this year. Lazaro is faithful to all the church services and soul winning activities, when he is not working. He works as security, 24-hours on, 24-hours off. While soul winning, Joel offered Lazaro to train in his police division so that her can work Monday-Friday with the weekends off. That way he can also enter the Bible Institute next semester. He can't do the training yet because his wife is about to have a baby in a couple of weeks and those who are in training live in the training facility for a month. In January, he will be trained and can enter in February in our Institute just in time for the next semester. I would not be surprised if Oscar, who would do most of the preaching during our furlough, and Nancy, our elementary teacher, are married before next fall when we go on furlough. Nancy was reached by the old church's bus route 22 years ago. She is now 29-year old and there are few in Mexico that have as strong convictions as she does. She would make a great wife for him. She just recently changed her membership to our church with the hearty approval of the present pastor of the old church. He actually approached me with the idea. In a few years, Oscar could end up being the pastor of the church so that I may still work out of the church to start other churches in the Mexico City area with the future Institute graduates, who may be the present students coming up through our Christian school. We'll see what the future holds. Thank you for praying for our VBS. Our people really worked hard to get kids out. We normally have on a Sunday morning about 50 kids ages 3-12. On our first day we had 90 children and it went up from there with a high day of 125 children and 18 parents on Friday besides over 20 workers. Almost all the parents that came with their children were brand new people. Eleven children and teens were saved during the week. We always have a closing day on Sunday, when the kids do a program of what they learned and receive diplomas. 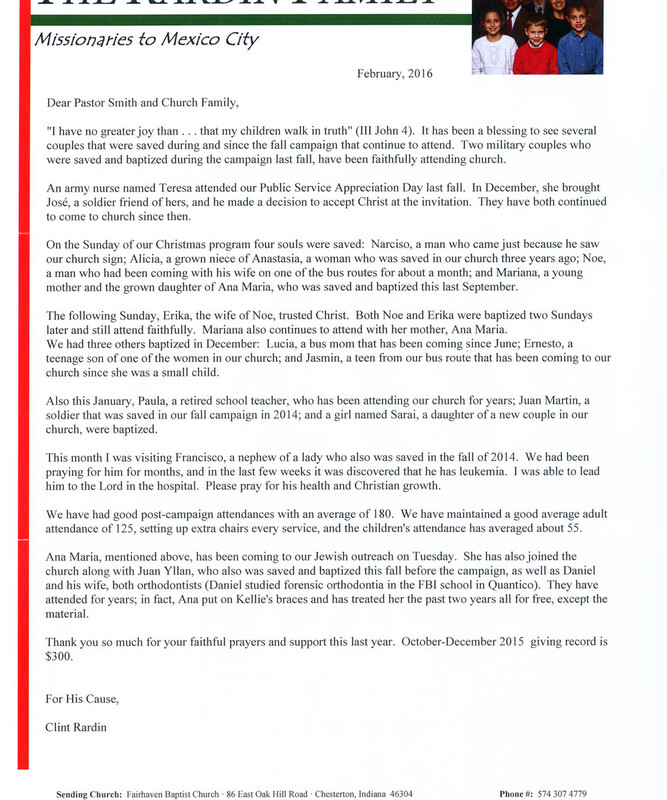 It is a way to get them in church and get their parents to come see them in the program. My hope was that we would see some of them come back. We were surprised how many came. We had 95 children in church and 143 adults for a total of 238! Many of the adults that came were Christians already. 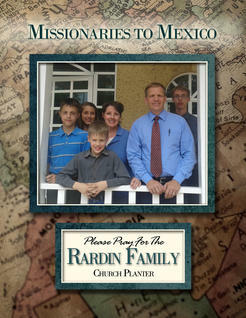 Our prayer is always that we may reach a new family. We may have a few new families that will continue to come, especially from Gaspar's route from where 50 came. Altogether, the routes brought out 124; more came out from the routes than the drive-in crowd. We may have even started an unofficial new route from a new area as a lady in our church brought out several kids and adults from a new area and we already have a couple families that have been coming from there for quite a while. We have been paying for their transportation even though we do not have workers to run it. As long as Maribel continues to bring people out, we will continue to help her with transportation. 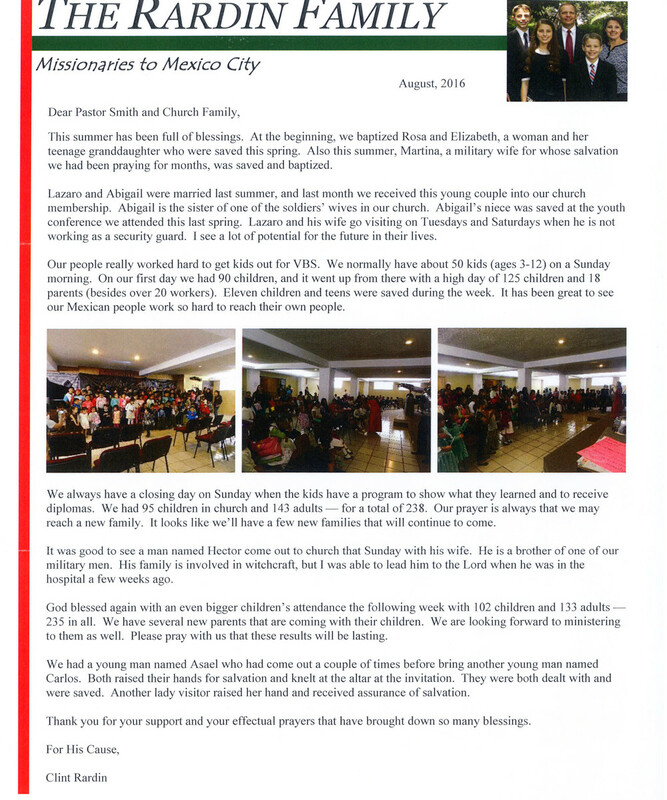 It has been great to see our Mexican people work so hard to reach their own people. It was good to see a man named Hector come out to church this Sunday. He is a brother of one of our military men. His family is involved in witchcraft, but I was able to lead him to the Lord when he was in the hospital a few weeks ago. It looks like our Christian school could almost double this year. On Monday I had a meeting with five families and I already have had two other families come and talk to me about our school. We could potentially have as many as 30 students. This Sunday, we had a very good day of 201 in church as the routes did very well and the auditorium was full with 134 adults attending. We have a new family that was saved on Kid's Day: Julio Cesar; Nicol, his wife; and Yareli, their teenage daughter. All three have now been baptized and have been bringing out family several times since. This Sunday, they brought out seven adults family members. Yareli has a couple of cousins she wants to take to teen camp this summer. Esteban, a recently retired thirty-year veteran, also saved and baptized this last spring campaign, continues to attend with his unsaved wife. Pray for Antonia's salvation. Esteban is talking to me about having his grandchildren come to our school. Rosa and Elizabeth,an older lady and her teenage granddaughter, both saved in the campaign, also continue to attend. then; but lately has been more faithful. After church, I was talking to Pablo about his leaving for a month on a anti-narco traffic operation and said to the wife that I hoped she would attend during his absence. She said that she was wanting to talk to me about that and I thought she has going to say that she wouldn't be able to come and bring her little kids by herself while he was gone. Instead she told me about a pastor's wife in Vera Cruz who pulled her aside and talked about salvation and proclaimed that she had "led her to the Lord", but that she hadn't understood the gospel. She said that through the preaching here, she now understands and that she wanted to accept the Lord. We praise God as we have been praying for her for quite some time. Pablo had invited a Christian lieutenant in his battalion to our church a few months back and Raul and his wife have been a attending now for over a month. Both Pablo and Raul are leaving on the same operation this week. These operations can be quite dangerous. I visited Raul and his wife for the first time this last Saturday. He is quite intelligent and is an Army engineer. We teaches a lot of classes in the army from tactics to military history. 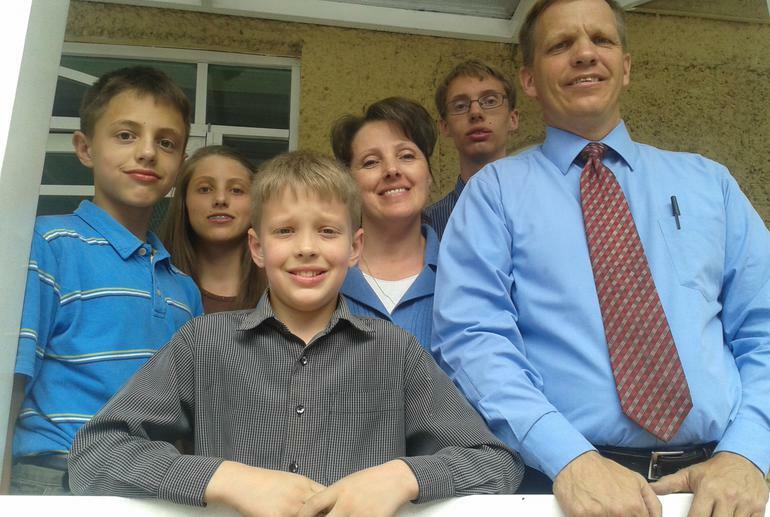 He met his wife who attended a Baptist in the north of Mexico and was saved in that church. He and his wife want to get more involved in our church and invited the people under him. cartel. Another soldier was shot and he went over to give his first aid, but he was already dead. Another soldier was wounded, but they killed three of the cartel. That is what I mean by the operations can be dangerous. Two other men of our church leave this week on a different operation as they both also are in another battalion. A couple of soldier's wives have told me that they have called their husbands on their cellphones in the middle of a firefight and have heard the firing of small arms in the background. 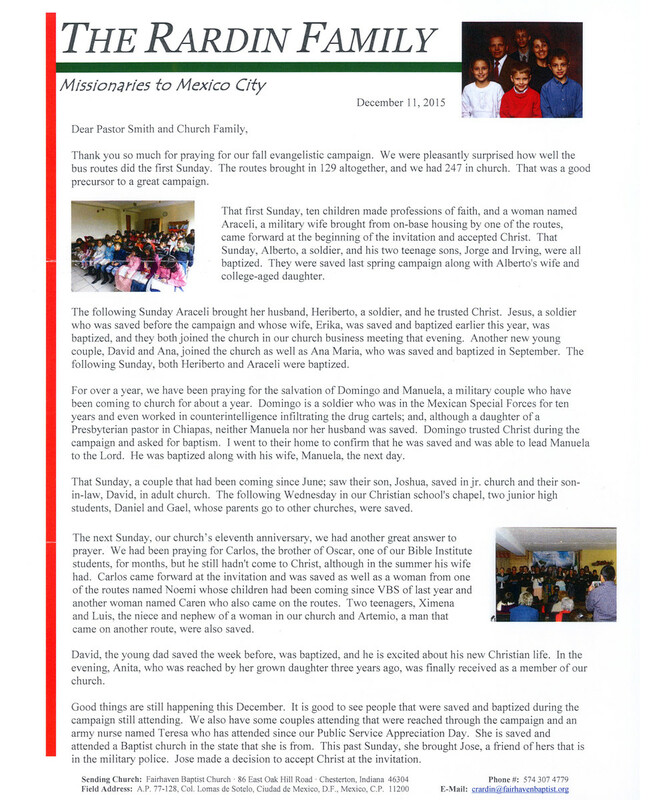 This month we received a young couple in our church membership. Lazaro and Abigail were married last summer. Abigail is the sister of one of the soldier's wives in our church. Her niece was saved at the youth conference we attended this last spring. Lazaro and his wife go visiting on Tuesdays and Saturdays when he is not working as a security guard. I see a lot of potential for the future in their lives. Thank you for prayers for our church. Good things are happening. We had a great final week of the campaign, Friend Day. Seven people made decisions for Christ -- two men and five women: one teenager from one of the routes; a woman named Clara that has visited before on our military route and the three people she brought to church; a woman named Irene, also from the military route; and a man named Humberto from another route. Julio Cesar, his wife Nicol, and teenage daughter, Yareli, who were saved on Kid's Day, have continued to come and brought out Nicol's sister and kids. They plan to be baptized a week from Sunday. Esteban, also saved on Kid's Day, brought his wife again. Pray for Antonia that she be saved soon. Sandra, a teenager of our church, was baptized after having been saved a couple of weeks ago. I have been teaching soulwinning in Sunday School for several weeks now. We have been seeing more going out on Tuesdays and Saturdays, especially on Tuesday. The last two Tuesdays, we have had a dozen people going out to pass tracts out to the Jews as well as gentiles. Some of the new soulwinners have been the two majors that were married in our church last December: the army engineer and the army doctor; also, Lilia, the teen that was saved at the Teen Conference came out last night with her married sister to pass out tracts to the Jews. Her sister and and sister's husband, who were married last summer, had started going out with us the Tuesday before. This last Saturday, Rhonda and I visited a young unwed mother, Rebecca, that was saved and baptized last year; but who had been missing church for a couple of months. We were able to talk to her mother, a lieutenant in the army, about her teenage who had lately has been rebellious. We finished by witnessing to her, but before I invited her to make a decision, I asked her if she understood. He didn't full understand, so we just invited her to come to church to hear more. The following day, I was surprised to see her and Rebecca and her brother there. At the end of the message, she raised her hand for salvation and we were able to lead her to the Lord. Also, Teresa, a lady invited by Joel, the police chief, also made a decision for the Lord. Last week, we went to an annual youth conference. We took 12 boys and six girls. One of the girls, Mari Carmen, goes to our Christian school, but attends another church with her parents. She made a decision to accept Christ. Another girl, Lilia comes to our church with her parents who were reached through our military bus route on base. Her dad, Alejandro, still unsaved, works in the Presidential Guards. Her mom and older married sister are saved and also attend the church. I asked Lilia on Sunday why she wasn't signed up to go and offered to pay her way. She still wasn't sure about going being new and all. At midnight that night she all of a sudden told her mom she wanted to go and the next day at 8:30, she was waiting at the church. I am sure it was the Holy Spirit that moved her to go because, that week, she accepted Christ at the conference and publicly professed her new faith in the morning church service. Yesterday, in our Thursday night service, we unusually baptized a man, Adaberto, who had been attending for several months, but only on Thursday as he works all day Sunday. The week before we celebrated the Lord's Supper, and although saved, he couldn't participate on the account of not being baptized; but after church he asked to be baptized, so we did last night. We ended the year with another soul saved. Erika, the wife of Noe, who was saved the previous Sunday, trusted Christ. Both have been attending for several weeks and both want to be baptized. It was a great ending Sunday to a great year with more souls saved than ever before, the majority of them baptized and continuing in the Lord. This Sunday I preached in Salina Cruz, Oaxaca on the Pacific coast about 11 hours away.. The pastor is the father of one of the women in our church. He took his church out of the convention a while ago. Pastor Enoch is 75 years old. 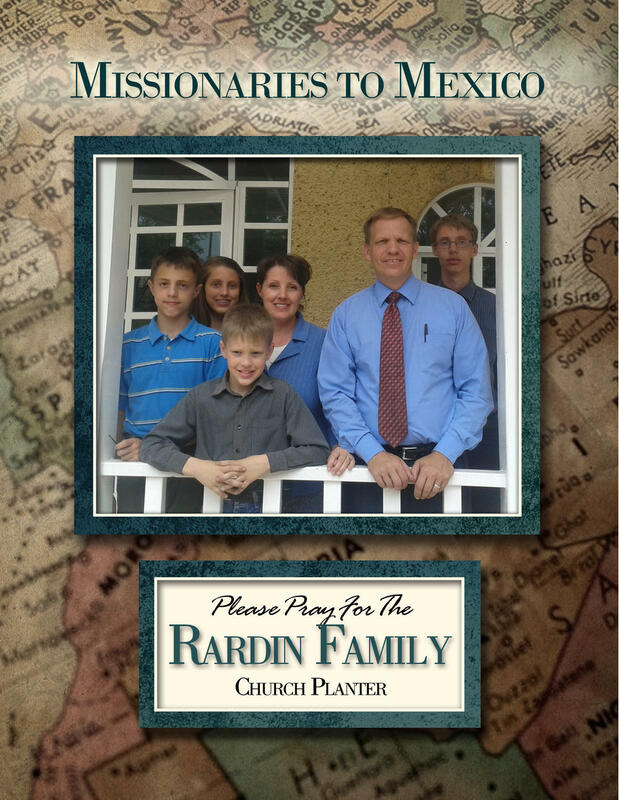 His father was a pioneer Mexican missionary who started evangelizing the region in the 1930's. His father was the first to start a Baptist church in Salina Cruz. Back in those days, there were no bus lines. He would have to take a train and then walk the rest of the way to Salina Cruz. When I was in language school yeas ago, we would go on cultural outings. One time we went to a small city called Tlaxcala. There in the town square there was a Baptist church. That same Baptist church was pastored by Enoch's father years ago, -- small world. Salina Cruz was a nice place to go for January. With dry heat and a very strong ocean breeze, my family had a very pleasant stay there. We hope you all had a Happy Near Year. We are entering what will be our 20th year in Mexico next December.